•Macedonian National Holiday Ilinden celebrated at Meckin Kamen on Wednesday. •Ilinden observed at ASNOM (Antifascist National-Liberation Assembly of Macedonia) Memorial Center in Pelince on Wednesday. With 69 votes for and 20 abstentions, distinguished theater director Ljubisa Georgievski was elected new Chairman of the Assembly of the Republic of Macedonia today. At the start of the meeting, the parliamentary group of BDI-PPD left upon explaining that mandatary Nikola Gruevski did not take into account the Albanian voters' will in choosing his government partners. •BDI-PPD coalition walks out of Assembly constitutive session and will not participate in Assembly work due to lack of respect for will of Albanian voters. •VMRO-DPMNE Executive Committee proposes Ljubisa Georgievski for post Assembly chairperson. Ljubisa Georgievski from VMRO-DPMNE is the candidate for the position chairperson of the Assembly, at the proposal of the VMRO-DPMNE Executive Committee. Macedonian President Branko Crvenkovski gave VMRO-DPMNE leader Nikola Gruevski the mandate for formation of the Government, the President's office informed. Macedonia has not done anything with which to provoke the surprising statement of Bulgarian Foreign Minister Ivailo Kalfin, and the state is committed to developing good neighborly relations and observing the European standards. This was the verbal protest note that the Macedonian Foreign Ministry conveyed to acting Bulgarian Ambassador to Skopje Kiril Jancev. Power rates are going to increase by at least 12 percent on 1 August. The Regulatory Power Commission should first approve the request of the state-run power transmission company MEPSO, which officially filed the request for an 11.63 percent increase on Monday explaining its move with the high price of imported electricity. VMRO-DPMNE interpreted BDI leader Ali Ahmeti's meeting with the former commanders of ONA (National Liberation Army) as direct blackmail intended to enforce continuation of the talks for BDI's entry into the Government. Nikola Gruevski's party VMRO-DPMNE is categorical that they would not yield under Ahmeti's pressure. 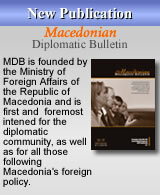 Macedonia's high foreign trade deficit exceeds 20 percent of GDP, which discloses a grave system problem. •Initial results of repeated voting in all 29 polling stations show BDI winning 7,575 votes, PDSH winning 3,155 votes, and VMRO-DPMNE winning 595 votes. •A total of 11,493 voters of the 29,036 registered voters in these polling stations exercised their right to vote Wednesday. The authorities of Skopje are going to consult with a delegation of the German firm Martin Rose over the next three days about introducing a tram network in the Macedonian capital. VMRO-DPMNE is going to ask the outgoing Government to fully stop the procedure for selling the Negotino thermoelectric power station, which, according to the party, has taken a very bad course. 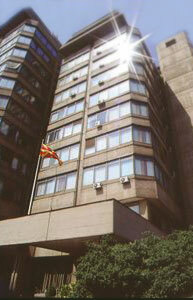 Macedonian companies last year invested abroad over 4 million dollars, the National Bank of Macedonian stated. Most of the money was invested in mining, metallurgy, office equipment and computers. Retail and wholesale trade is likewise a target of Macedonian firms. According to the National Bank, Macedonian companies invested most in Albania (2.5 million dollars), China (1.1 million dollars) and Serbia and Montenegro (312,000 dollars). •EU Representative to Macedonia Erwan Fouere denies that European Union is participating in negotiations on formation of new Government. The constitutive session of the Assembly most probably will be held on 26 July. •State Election Commission decides to repeat vote in 29 polling stations. SIEMENS TO COME TO INVEST NEXT YEAR? Siemens of Germany will definitively come to Macedonia despite the government shift in the recent elections and the fact that the consortium signed the Memorandum of Understanding with outgoing Prime Minister Vlado Buckovski. The elections at two polling stations in Bogovinje and Dzepciste were annulled due to irregularities on election day. This was the decision made by the State Election Commission yesterday afternoon. The elections will be repeated in these two polling stations on 19 July. Nikola Gruevski, leader of the coalition "For a Better Macedonia", secured a majority for formation of a government. 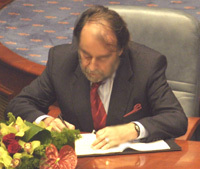 Over the last few days he made an initial agreement for formation of a coalition with New Social Democratic Party leader Tito Petkovski, Democratic Regeneration of Macedonia leader Liljana Popovska, and Democratic Party of Albanians Deputy Chairman Menduh Thaci. •State Election Commission rejects all complaints about election irregularities, submitted by political parties. The United States and the European Union gave a positive assessment of the elections in Macedonia yesterday. Their general comment was that these parliamentary elections were better than the previous elections and that they represent a significant step forward for Macedonia in the process for integration into the EU. They urged the authorities to implement the law and punish all those who provoked irregularities during the elections. 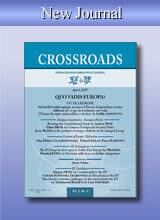 •US and EU praise elections in Macedonia and call for speedy formation of government that will implement rapid reforms. The coalition led by VMRO-DPMNE won at yesterday's parliamentary elections in Macedonia. This opposition party was the first to announce that it defeated the "Together for Macedonia" Coalition. SDSM leader Vlado Buckovski conceded defeat and he congratulated VMRO-DPMNE leader Nikola Gruevski on the victory over the phone. •State Election Commission (DIK): VMRO-DPMNE wins 32.4%, SDSM 23.3% of votes. •Processed data from 99,43 percent of all polling stations shows VMRO-DPMNE leading in five constituencies, DIK reports. According to the initial results of the State Election Commission (DIK), the opposition coalition "For Better Macedonia" headed by VMRO-DPMNE polled more votes than the other parties. DIK announced these data after having processed 10 percent of the vote. The political parties' initial assessments of the fifth parliamentary elections are good in general, with a few minor remarks. Only the parties from the Albanian political block, BDI and PDSH, aired serious complaints concerning the elections process, accusing each other of irregularities and announcing lodging of appeals with the State Election Commission (DIK). All the polling stations closed at 19.00 hrs in the fifth parliamentary elections in Macedonia. The general impression is that the elections went in a fair and democratic atmosphere with minor irregularities. The State Election Commission (DIK) processed 75.81 percent of the polling stations across the country and announced that by 17.00 hrs, 42.61 percent of the voters cast ballots. DIK Spokesperson Zoran Tanevski stated that in the village of Dzepciste the voting was fully stalled due to abuse of the right of vote. Another polling station was closed in the village of Brvenica for the same reason. DIK informed that 25.56 percent of the total number of registered voters voted by 13:00. The Statel Election Commission arrived at this figure by processing the data received from 75.17 percent of the polling stations in the country.